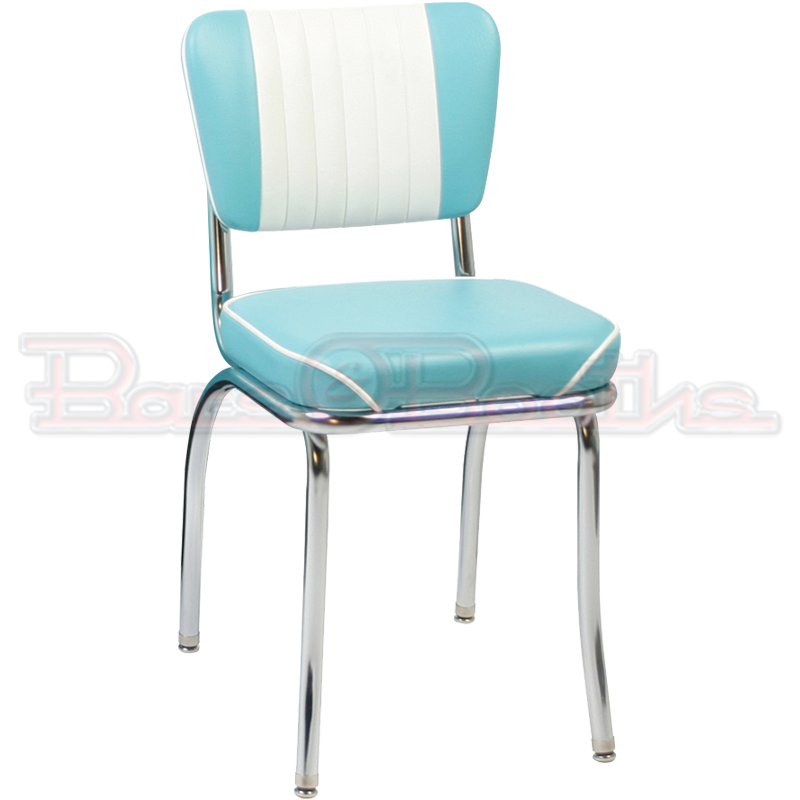 This is our classic C1 Malibu Channel Back Diner Chair . Same chair that has been used for over a half a century in restaurant and diners. These chairs are commercial quality but classy enough for any kitchen or game room. This chair has an insert channel in the back upholstered in a contrasting vinyl, and is pictured with a 2 inch waterfall seat pad for added comfort. We custom build these chairs using your choice of our standard vinyls, or you may choose from the very cool zodiac, sparkle, and cracked ice vinyl’s. Call 304-728-0547 for pricing, or send us an email if you have any questions. Classic C1 – Malibu Channel Back Chair. Same chair that has been used for over a half a century in restaurant and diners. Rated for up to 400 lbs, these chairs are of commercial quality but classy enough for any kitchen or game room. This model features stitched middle channels on the chair back and a 2 inch seat pad with attractive water fall piping design. For pricing information on our chairs give us a call at 304-728-0547. Or send us an email and one of our retro specialists will respond right away. We offer a great commercial customer discount when ordering in large quantities. Let us help you build your diner or retro restaurant. Please allow 3-4 weeks for special orders. We also carry some of our most popular models in stock in our warehouse. Give us call to learn more about our in stock merchandise. Call 800-507-7632 to place your order today!